The Band-tailed Cardinalfish (Apogon kallopterus) can also be referred to as the Iridescent Cardinalfish. The fish has various scientific names which include Apogon snyderi, yaeyamaensis, Pristiapogon snyderiI and Apogon fraenatus. The fish can be found in the waters of the Indo-Pacific, South Africa and the Red Sea, south to Algoa Bay. It can also be found inhabiting the Hawaiian Islands, south to New Zealand and Rapa and the Pitcairn islands, north to southern Japan. However, the Band-tail black spot Cardinalfish is native to Tahiti and it is on e of the larger species of the Cardinalfish fish species. The fish can grow widely to gaining the highest size of six inches. 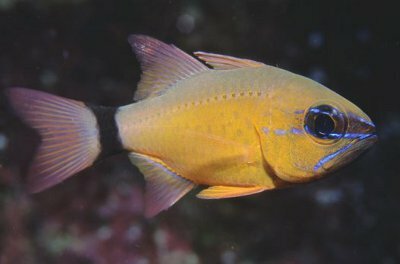 The body of the Band-tailed Cardinalfish is oval in shape, silvery colored with a lighter color of pinkish orange at the base and a horizontal stripe or band which is colored black and runs from the nose to the tailor the caudal peduncle and eventually fading close to the peduncle. A conspicuous black spot exists at the base of the tailor at the caudal peduncle. The fish is generally referred to as the Band-tailed Cardinalfish due to the black spot which is present as the base of the tail. The fish can be kept in an aquarium of seventy gallon or a bigger aquarium filled with live rocks caves and crevices. A peaceful tank mate is suitable for the methodical and slow swimmer. The fish tends to hide in various sea plants and other sea grasses. The fish can also use long urchins which are spiral-shaped for camouflage. If a larger tank aquarium can be made available, then small juveniles of the species can be kept. It is necessary to note that, the fish can establish great hierarchy without aggressiveness if they are kept in multitude. The water conditions in the aquarium require to be maintained between seventy two to seventy eight degrees fareinhet with pH values of 8.1 to 8.4. The Band Tail Cardinalfish can feed on a balanced diet of meaty foods like frozen brine shrimp, chopped fish, frozen mysis and live feeder fish depending on its size.